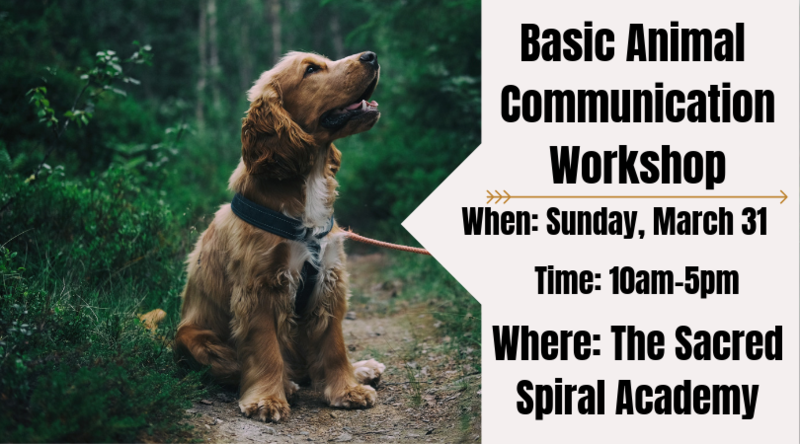 Our Basic Animal Communication Class is Approaching! Do you find yourself wondering what your pet is trying to tell you? Join us Sunday, March 31, for a Basic Animal Communication Class to learn how to strengthen your bond with your pet! Guest instructor, Lynn Schuster, will join the Sacred Spiral Academy on Sunday, March 31. Lynn will teach you her techniques for communicating with animals and how to strengthen your bond with them through a meditative process. Registration is required - only 6 spots available! As a Telepathic Animal Communicator, Lynn has the ability to hear what animals have to say and is able to help strengthen and bond relationships between animals and their human families. Through a meditative process, she can hear and sense what animals would like to tell us. She is able to speak to all animals, including those animals who have died. She helps people connect with their animals, encouraging love and healing for the Highest Good of All. She will teach YOU the same process that she uses.